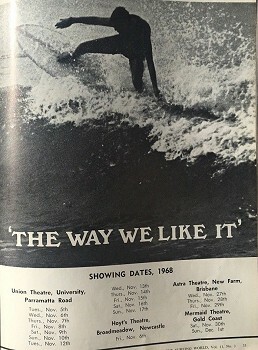 Albie Thoms: Surfmovies - a History of Surf Films since 1897. The Blue Group, PO Box 321, Noosa Heads Queensland 4567 Published 2000. A 25 second sequence of waves breaking on the coast at Monterey, California, filmed by Frederick Blechynden about September 5, 1897. Released by Thomas A. Edison, Inc. (Copyright: 25Oct 1897; 60587), the producer was James White. Robert Kates Bonine, Thomas A. Edison, Inc. 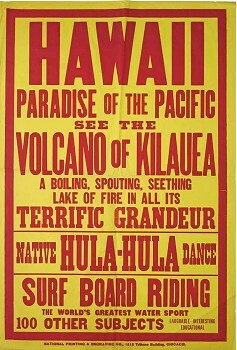 The first film of surfboard riding, the film was marketed early in 1909, and continued to sell and be used on the lecture and film circuits through at least 1913. It's official mainland premier was at the 1909 Alaska-Yukon-Pacific Exposition, as part of the Hawaii exhibit. 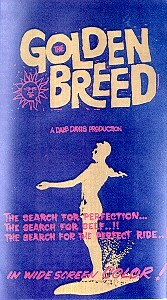 Promotional poster (41-1/8" x 28") advertising an unidentified show or exhibit. 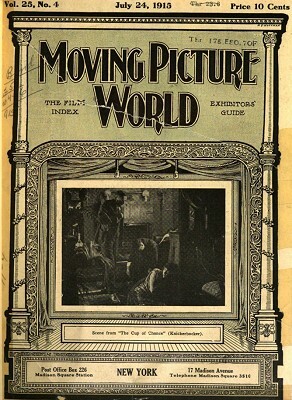 Some have suggested that the poster was instead issued in conjunction with magic lantern slide lectures given by famed Hawaii photographer Ray Jerome Baker. 1915 Riding on surfboard, Oakland, California. One of the earliest films featuring surfboards and surfing in the plot, Feet of Clay was a 1924 American silent drama film directed and produced by Cecil B. DeMille. Starring Vera Reynolds and Rod La Rocque, with set design by Norman Bel Geddes, the film is based on the novel by Margaretta Tuttle, and Beulah Marie Dix's one-act play Across the Border. Feet of Clay is now considered lost. Plot: Kerry falls in love with Amy and saves her life in a surfboard race though his foot is bitten by a shark. Dr. Lansell tells him to keep off his foot for a year. He weds Amy, but Dr. Lansell's wife Bertha wants him too. Filming Locations: Santa Catalina Island, Channel Islands, California, USA. Grosset & Dunlap, New York, 1923. 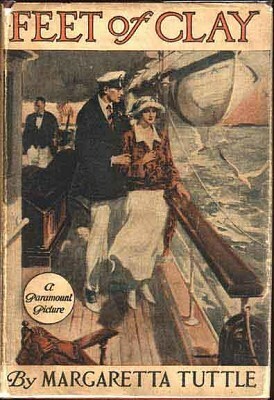 The Photoplay Edition has 7 internal stills, one showing the two female leads with surfboards preparing for a surfboard race. Surfboard riders at the north end of Bondi Beach, riding solid timber boards. From the newsreel The Spectator Magazine . Watched a fascinating short on TMC channel called ‘Water Trix’. It features Preston ‘Pete’ Peterson, well known 360 degrees waterman. Lots of wild crazy tricks on custom built water skies, using paddleboad, logs, tandem and shooting between the boulders of the Santa Monica Breakwater, mostly shot in the ocean around Santa Monica, pier can be seen in background. Film produced by Charles Trego, 1948, released in 1949. I could not find it on Youtube. Really hi-lights the incredible water related talents of Pete Peterson, and anything but normal. Professional state of art 16mm/35mm arial photography from helicopter developed during WWII. 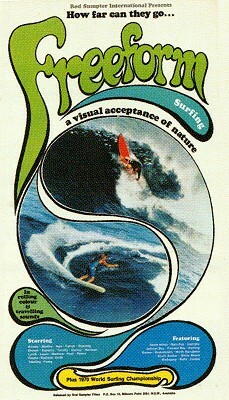 Surfing Museums should obtain a copy. Colour footage of USA surf team to Melbourne Olympics surfing their Malibu boards in Australia. Shot for Ampol (petrol company) it was shown around the Lifesaving Clubs and helped spur the acceptance of the new design. Now in the Australian Film Archives it regularly appears in TV documentaries, particularly the ABC. Note the footage also includes Duke Kahanamoku at Freshwater in 1956 with his board from 1915. Includes footage from Torquay Carnival and Sydney. 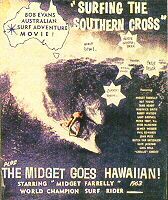 The first commercial release in Australia, shown by Bud at Queenscliff Surf Club, 14 December 1957. Bud Browne’s film of his 1957 visit. From the novel by Fredrick Kohner, Gidget, the Little Girl with Big Ideas, and based on his own daughter, Kathy. The first of a string of Hollywood surf movies, directed by Paul Wendkos and starring Sandra Dee, James Darren and Cliff Robertson. 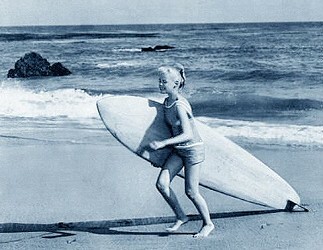 Surfing by the Malibu crew including Mickey Dora (as Moondogie) and Mickey Munoz, reported as doubling as Gidget in a blond wig. However, note that in the surfing footage below, Gidget is a goofy-footer. 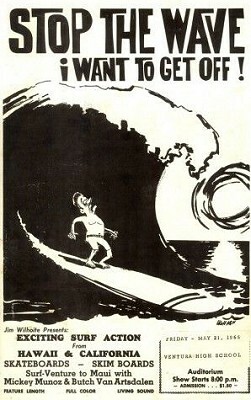 Quality in ANY language: in the first edition of Surfer magazine, 1960. 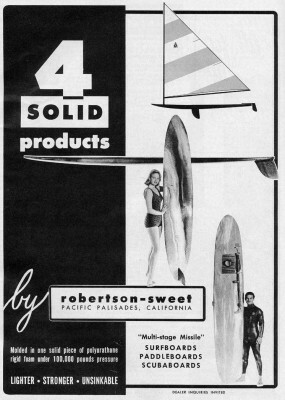 Following the film's release, Cliff Robertson went into partnership with Rodger Sweet, brother of Dave Sweet, in the short lived Robertson-Sweet Surfboards of Pacific Palisades, California. Robertson-Sweet ... 4 Solid products: Diving magazine ?, 1962? A complete range of dive and surf equipment including spear-guns, wetsuits surfboards and paddleboards. The Scubaboard, bottom, apparently has a see-though underwater window inserted through the board. The sailboard with centre-board and fin is only an illustration. Moondoggie paddles Gidget back to the beach. James Darren, Sandra Dee and Cliff Robertson. 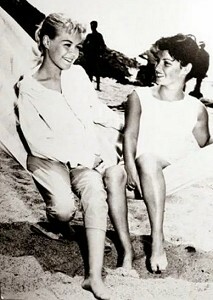 Sandra Dee and Kathy Kohner. Bob Evans.- first movie by Bob Evans. Dave Jackman, Bob Pike, Midget Farrelly. Note: The only work of Bob Evans that has been transferred to video appears in small segments in Nat Young’s ‘The History of Australian Surfing’ 1985. See below. Bob Evans died in 1976. Film Australia probably have copies of at least some of Evan's films, but since nothing has ever been commericially released I suspect that there must be some legal dispute over who holds the copyright. Given Evans died 30 years ago, it would seem highly unlikely these films will be commerically available in the near future, if ever. 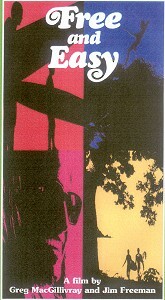 Bob Evans' Ride a White Horse, 1968, was released on DVD in 2009. See below. 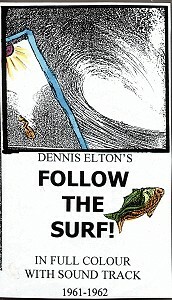 This was an original surf film, the title re-used by John Milhouse for his Hollywood production,circa 1978. 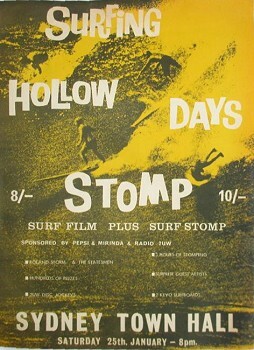 1962 Surfing Hollow Days . 2UW Disc Jockeys 2 Keyo Surfboards. Compilation of sequences from previous films. 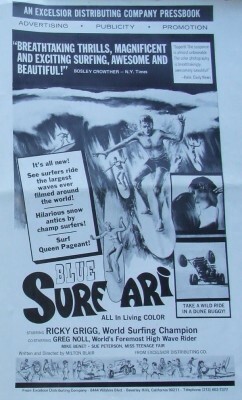 Original print shown on the surf movie cuircut, US and Australia. 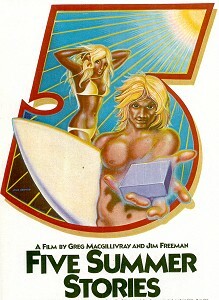 “Still others like a short bellyboard (sic) and a long ride like George Greenough at Santa Barbara, California” – Bruce Brown in the introductory sequence of The Endless Summer. Excerpt featuring Bobby Brown, Nat Young & Kevin Platt surfing at Angourie, Northern NSW. The footage formed part of the Bobby Brown: Surfing Legend exhibition touring Australia in 2010-2011. 00:00 Footage from Walk on the Wet Side (1963) see above. 12:00 Start with only a hint of the opening credits for Strictly Hot (1964) ? 1:00:00 Opening credits for Inside Out. 1:53:00 Pat Edwards riding the biggest wave ever filmed. 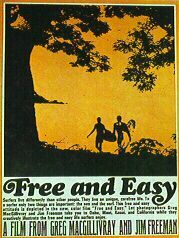 1966 The Endless Summer- 35mm Columbia Pictures release, with 3 minutes cut. 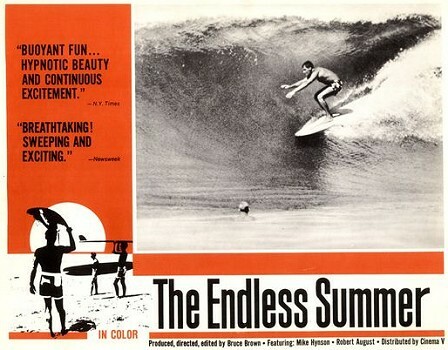 The Endless Summer, 1966, featuring Phil Edwards. With Nat Young and Peter Drouyn. Includes San Diego World Titles and Hawaii. As a bigger swell hits Noosa Heads in the winter of 1966, Nat Young, Bob McTavish and George Greenough try out their new boards, getting playful on the waves. This idyllic footage from the winter of 1966 shows how good Nat Young had become, just before he went to the US to win the World Championships. Bob McTavish, 45 years later, described this footage as about as good as longboard riding could get. The playfulness with which these three innovators perform tricks for the camera gives a good sense of how complete was their mastery of these boards and conditions. When this film was shot, surfing had already become a lifestyle, not simply a sport. The combination of elements here – the music, the light, the gracefulness of the technique, and the final narration – are all about giving a sense of the desirability of that lifestyle. Released on DVD in 2009. Bob Evans' Ride a White Horse was a distinct disappointment when first released in 1968, coming at the height of radical developments in surfing performance and an associated explosion in surfboard design. In a compilation drawn from previous films dating back to 1960, the movie contained no footage that was remotely current and Australian audiences were small and scathingly critical. The latest film was the performance of Australian surfers at the 1966 World Championships in California, emphatically won before the completion of the final round by Nat Young riding Sam, a thin railed 9ft 4 with a Greenough fin. Other finalists included Rodney Stumper (while competing here for the U.K., Sumpter began his surfing career on Sydney's Northern Beaches) and Midget Farrelly riding his ground-breaking Stringerless model. Six months later, in mid-1967, these Australian designs would morph into the Sydney-centric Vee-Bottom Stubby, largely initiated by professional rivalry between Midget Farrelly at Palm Beach and Bob McTavish working for Keyo Surfboards at Brookvale. Initially about 9ft long, by then end of the year some Vee-Bottoms were down to 7ft, a substantial reduction of 25%. While length decreased, the surfing performance of the Australian elite exploded, perhaps best expressed in the surfing of Victorian prodigy, Wayne Lynch. The progress was demonstrated at a contest with visiting American members of the Windansea Club in October 1967 and clearly documented in Eric Blum's Fantastic Plastic Machine, 1969. Subsequently, Australian surfboard designers lead a continuous reduction in board length and widths became progressively narrower. September 1968, Volume 11 Number 3 page 33. England, France, Morocco and the 1968 Puerto Rico World Contest. River Severn and Bay of Fundy Tidal Waves. 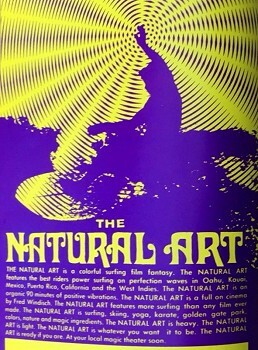 The poster flips Dr Don James' 1965 photograph of Rusty Miller, turning the Sunset Beach peak into a left-hander. 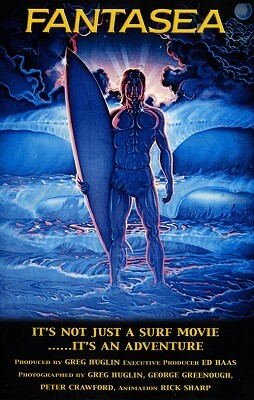 Transition period for short-boards in Hawaii and California. Volume 14 Number 2, 1970. The (uncredited) soundtrack includes the drum solo from Iron Butterfly's In-A-Gadda-Da-Vida. Rolf Arness and Wayne Lynch. 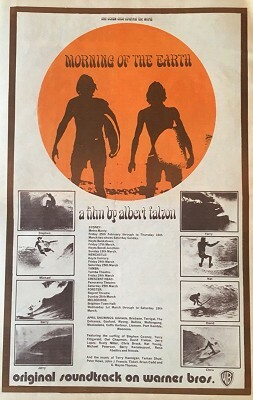 "On your list of surf movies you appear to have omitted a couple of Australian surf movies from the late sixties or perhaps 1970, one of which was called Solid Glass Tube and was produced by Ray Young ( I think). It was a shocker (out of focus etc) but I think he produced a few movies around that time. 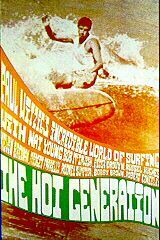 I also vaguely recall reading a surfing article in recent times about Ray Young and how he used a few different names to produce surf movies around that time. You might like to investigate this further." Later released as Sunshine in 1973. 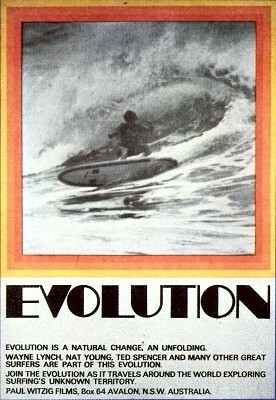 - Surfing World Volume 14 Number 2, 1970. Footage of the 1971 Australian Titles at Bell's Beach. 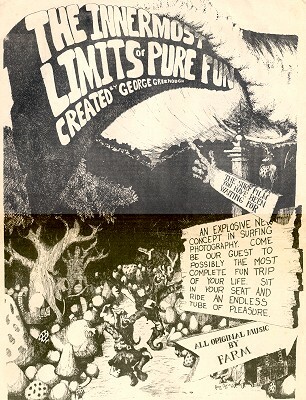 - Advertised on back cover Tracks (magazine) #6, March 1971. Steve Core, first commericial release. High light:Peter Drouyn’s backhand attack at Tamarin Bay, Mauritius, west coast Africa, Canary Islands, Morocco, southern France, Japan and / or Bali (?). Other surfers Bruce Channon, Brett Evans. Australian travelogue with limited surfing sequences (10%) almost exclusively featuring Reno Abelliro at Eyre Penisular, South Australia and Margret River. Premiere Sydney Opera House 28 November 1973 ? Portrait of George Greenough as surfer, fisherman, sailor, designer and builder. Final sequence was Greenough’s Echoes, see below. 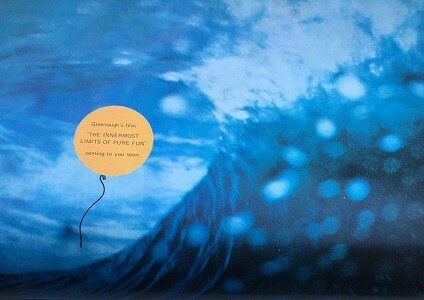 George Greenough, (USA), insert in Falzon’s Crystal Voyager. 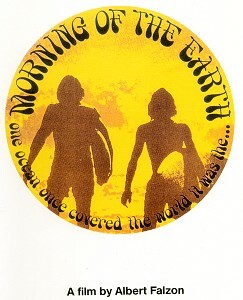 Edited surfer’s view water footage of Rincon and Lennox Head developed from the previous ‘Coming of the Dawn’ / Innermost Limits of Pure Fun, 1969. Phil and Russell Sheppard / Bruce Usher Films. Queensland, NSW North and South coast, Bells. David Sumpter, (also Oceans? Rodney/David). SURFERS: Nat Young (pintail), Wayne Lynch (Pat Morgan Surfboards Keel), Kim ‘Fly’ Bradley, Lopez (Lightning Bolt Surfboards Pin), Hakman, Drouyn, MP, Fitzgerald (sprayed Brewer Pin), Neilson Brothers (Tri fin). Note 1st leg ropes. LOCATIONS: Whale Beach,Avalon, Wreck Bay, North Narrabeen, Fairy Bower, NZ, Kuta, Ullawatu, horrible old ski footage, Burleigh Heads. Bob Cording and Jerry Humpries. Australian Premier 9th April 1975, Alhamba Theatre, Brisbane. Michael Peterson / Snapper , Maurice Cole, Terry Fitzgerald and David Treloar / Queenscliffe, Kris Puckeridge; hang gliding, trailbikes. Premier: Manly Silver Screen, 26th June 1975. Steve Core, second and final commercial release. SURFERS : Shaun Tomson, Terry Fitzgerald, other Australians. Bill Delany , water footage by Dan Merkel. Surfers : Shaun Tomson, Mark Richards and Rabbit Batholomew. *The definite film of this period, below Phil Byrne 1-8. Also George Greenough and Peter Crawford, Animation by Rick Sharp. 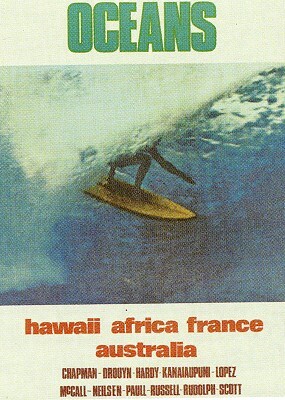 Fantasea was filmed in South Africa, Hawaii, Australia and California from 1976-1979 and features Terry Fitzgerald, Bobby Owens, Buzzy Kerbox, Tony White, Simon Anderson, Chris Byrne, Ricky Rasmussen, Andrew McKinnon and Mark Warren at Jeffreys Bay in July 1977, perhaps the best 10 days ever. South African Gavin Rudolph, Shaun and Michael Tomson at Cave Rock in Durban. Mark Richards riding his first early twinfin in Hawaii. Buttons Kaluhiokalani, Dane Kealoha and Mark Lydell riding perfect V-land. Colin Smith at Pipeline, Steve Butterworth at Summercloud Bay in Australia. Rory Russell and Gerry Lopez at Pipeline 1978. Mark Foo disco dancing and surfing at Burleigh. George Greenough and Paul Gross airmat riding perfect California. Peter Townend, Jeff Crawford, Jackie Dunn, Michael Ho and a cast of thousands on the North Shore. 00.00 - 03.10: Andrew McKinnon, Peter Crawford and Simon Anderson at Angourie. 03.11: Jefferys Bay- Terry Fitzgerald, Reno Abellira, Buzzy Kerbox, Bobby Owens, Rick Rasmussen, Simon Anderson,Tony White, Critta Byrne, and Andrew McKinnon. 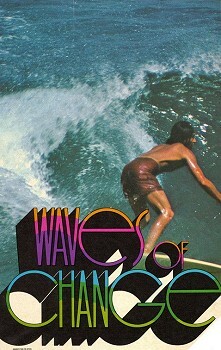 Here is what I guess would be a 1983 video, probably just before or after the 1983 Rip Curl Wave Classic in Torquay. 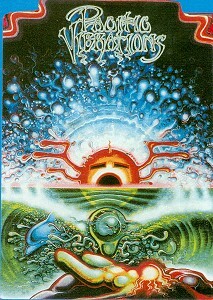 The sails appear 1983. I recognise in the video the Gaastra Powerhead Wave sails with Rainbow used by others (a 1983 issue) and it is definitely pre 1984. It is noted Fraser Black is using a Bombora rope universal provided to him possibly by Mark Paul. Good shots of Diamond Head. Notice Fraser is not using a harness. 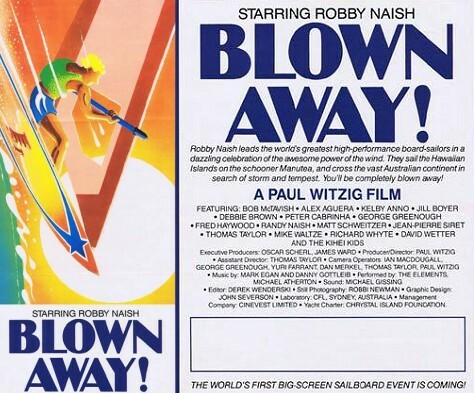 Would be good to see this again on the big screen, was the first windsurfing movie I ever saw as a teen. It may of had a Diamond Head section along with riding The Door, McTavish's Stingray looking board & Greenoughs spoon board with stainless fin. 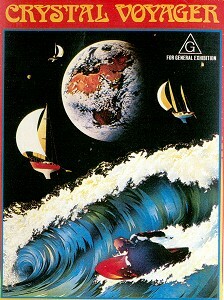 Classic VHS 1980's windsurf video - First part is the Pan Am Cup which was the premier windsurf event of its time. Second Part is Robby Naish wave jumping at Diamond head with Karl Messmer on early prototypes of Mistral take off. Last Part is taken at the North Shore with Robby on proto Mistral Take off. Other Sailors possibly Cort Larned (blue and yellow sail), Ken Winner (all yellow sail and board) and Malte Simmer on first fat head sails with yellow swallow tail board. My name is Guy Finlay and I was looking through your site recently and noticed that there was a gap in your lists of surf films/videos. It was in 1988 that I linked up with Tim Bonython ( a nightmare in itself!) and filmed, produced and directed Water Slaughter and Strikeforce. 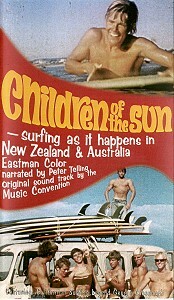 At the time they were the state of the art of surf film and we were, as Australians, sticking it up the americans again. I made the comment on the cover of the video slick that " Austaralians are the best surfers in the world" and they were at that time where the Top 16 were all Aussies. When I went to the states with the tapes in June, 1988 the distributors nearly didn,t take it up because of that statement! Recently Albie Thoms wrote his book and contacted Tim for info on these two films but unfortunately for him and anyone that deals with Tim he got the "Tim is the god of all surfilm makers" stream and did not get the truth of how these two film/videos were made. I have contacted Albie and given him the facts with regard to the production and I hope that if there is ever a reprint of his book that they can add more information. If you are still into it I can help with more info about surf films and videos from the inside. Relevant Links Longboarding - page by Stephen P., includes extensive surfing video catalogue with reviews. 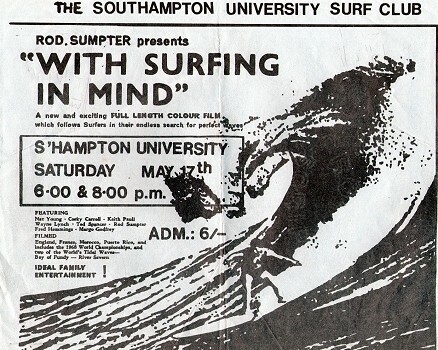 Poster Exhibit - nostalgia plus with this collection of Surf film poster scans.